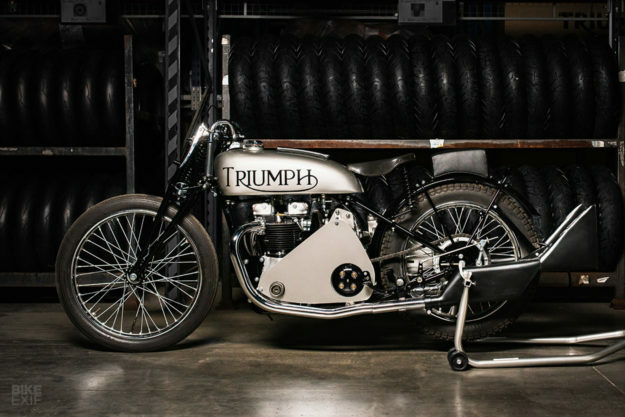 One of the most famous names in the history of British motorcycling has returned: the Triumph Speed Twin. It first caused a stir in 1938, when Edward Turner’s parallel twin offered unprecedented levels of power for a 500 cc bike. 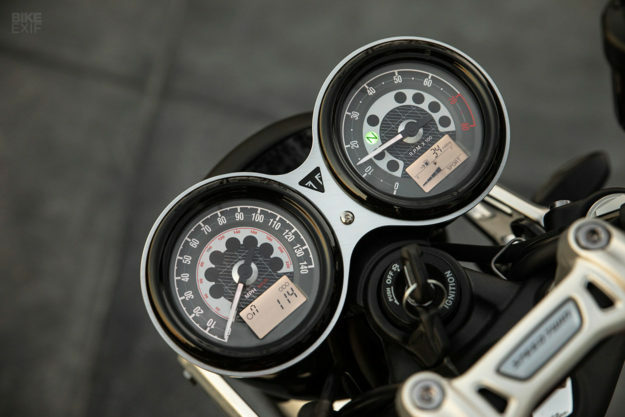 The original Speed Twin created a template for many other manufacturers to follow, and the lineage is still visible in Triumph’s ‘Modern Classics’ range today. But the new Speed Twin is a very different beast. With 1200 cc and almost four times the horsepower of its predecessor, on paper it’s a cracker. 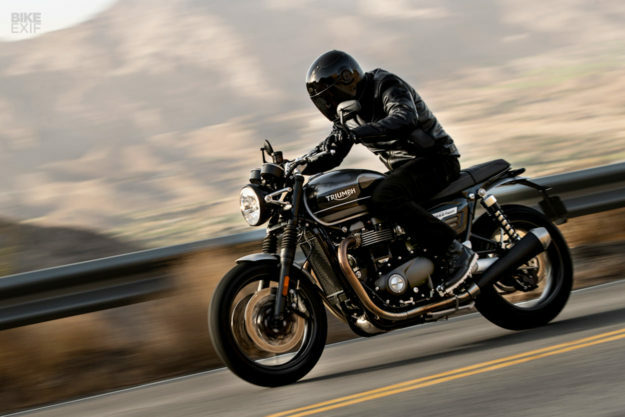 It’s recognizably a Bonneville, but with a pumped-up, muscular style and a very obvious focus on the riding experience. 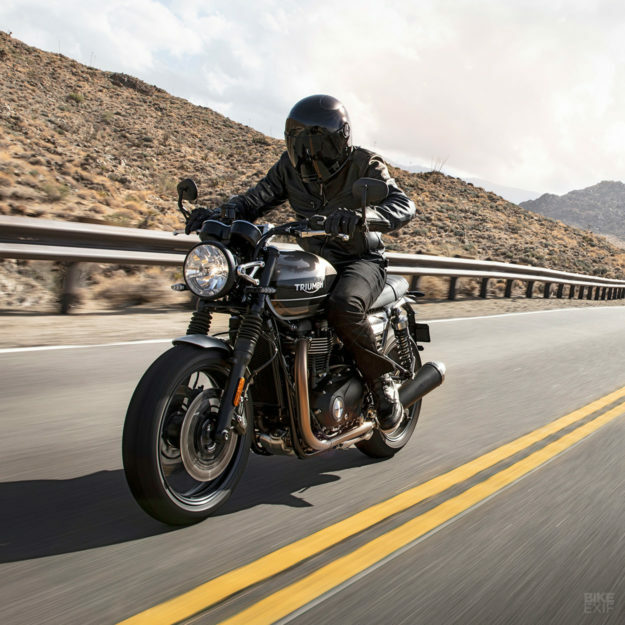 It’s more than a boulevard cruiser, and is likely to trouble bikes such as the established Ducati Monster and BMW R nineT, and the incoming Indian FTR 1200. 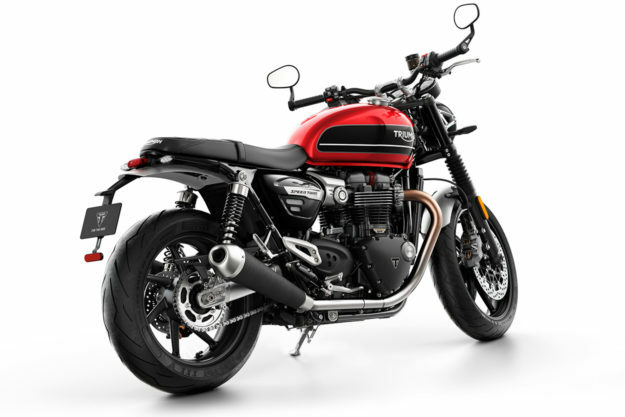 The engine is the 1200cc ‘HP’ version of the Bonneville twin, in the same tune as the Thruxton and with the same 11:1 compression ratio. There have been some updates, including a low inertia crank, so it’s not exactly the same as the Thruxton motor. 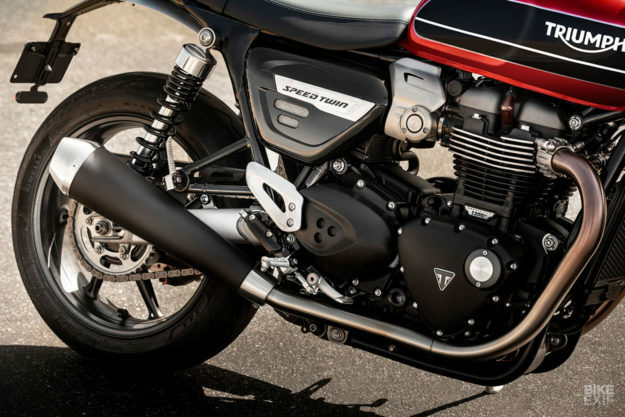 The cam cover is now magnesium, and the engine cases are ‘mass optimized.’ It’s a new emphasis on weight saving that sees the Speed Twin tips the scales at ten kilos less than the Thruxton. The cooling system is also updated, and the first major service interval is at 10,000 miles (16,000km). 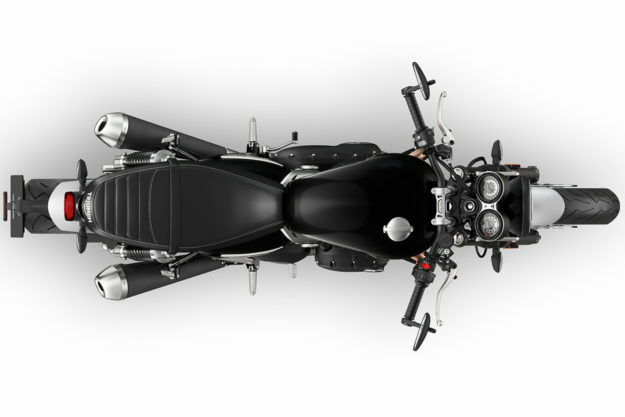 Peak outputs are the same as the Thruxton R: 97PS at 6,750 rpm, with a peak torque of 112 Nm at 4,950 rpm. We’re promised a ‘distinctive British twin sound’ from the pair of black upswept mufflers. 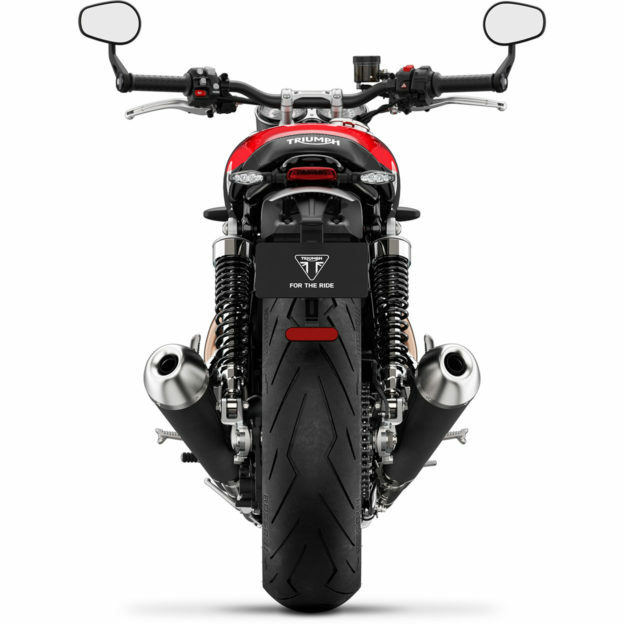 Those figures are close to the BMW R nineT, which must be considered the benchmark. The Triumph falls short by some 13 horsepower and 4 Nm, but delivers its peaks much lower in the rev range—suggesting that its power will be more accessible. The German bike is 220 kg wet, compared to the Triumph’s quoted 196 kg dry. Add on around ten kilos for fuel and a bit more for oil and other fluids, and there’s probably nothing in it. There are the three selectable riding modes—Sport, Road and Rain—and switchable traction control. ABS is obviously standard, although there’s no word on the tech involved here. 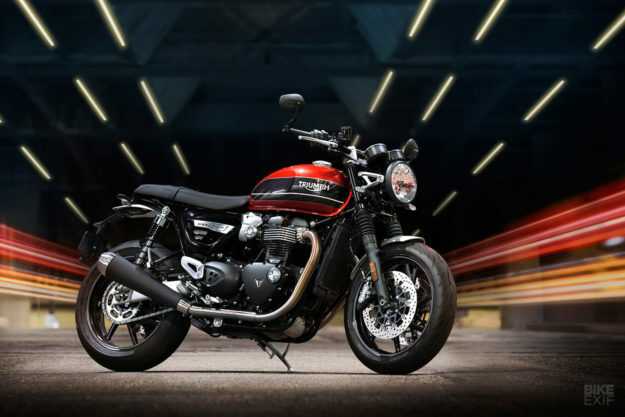 The clutch uses Triumph’s familiar ‘Torque assist’ system, which is not a full slipper clutch but instead offers a lighter lever pull for stop-start traffic. The frame is new, but adapted from the Thruxton R. At the front are 41mm cartridge forks, which are apparently not adjustable. At the back, there’s a conventional twin shock setup with adjustable spring pre-load. Braking is close to the state of the art, with Brembo 4-piston fixed calipers and twin 305 mm discs at the front, plus a 2-piston Nissin floating caliper and single disc on the rear. The wheels are lightweight 7-spoke cast aluminium jobs, measuring 17 inches both front and back. They’ll be shod with Pirelli Rosso Corsa 3 tires, developed from WSBK technology. It’s quite a departure for the Hinckley Bonneville, which since its rebirth in 2001 has been a rather laidback roadster. But there is a precedent with the Speed Twin: in 1938, intrepid racer Ivan Wicksteed supercharged an early model (below) and lifted the Brooklands circuit speed record with a 118 mph lap. 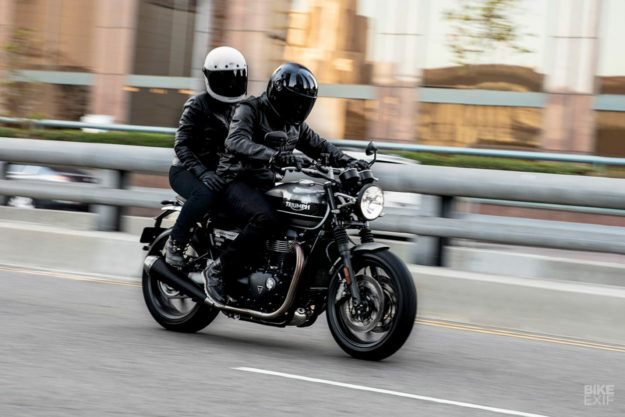 Despite the decidedly sporting specs of the 2019 Speed Twin, the essential qualities of the Bonneville platform are all present and correct. The riding position is upright, the pillion-friendly bench seat has a low height of 807 mm (just under 32 inches), and the twin instruments are a pleasing mix of analog and digital. 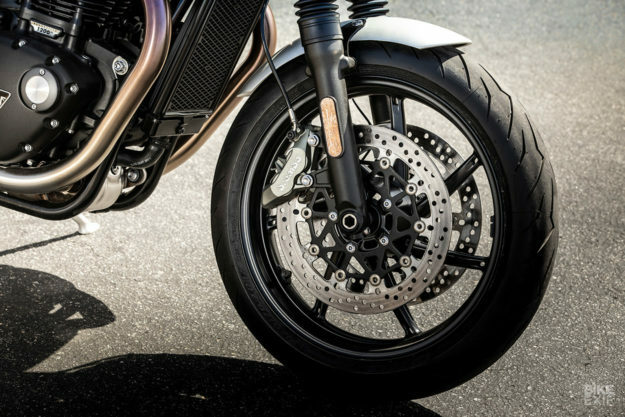 Other niceties include a Monza-style fuel cap, a USB charging socket, a built-in immobilizer for extra security, LED lighting all round and a massive catalog of accessories—including Vance & Hines exhaust systems. The new Speed Twins will start hitting showrooms around the world in Spring 2019. There’s no word on pricing yet, but we do know that three colors will be available. There’s a stealthy Jet Black, plus ‘Silver Ice’ and ‘Korosi Red’—both of which are overlaid with Storm Grey and have hand-painted pinstripes. The new Triumph will be made available for journalists to road test in January, and we’ll report back then with riding impressions. 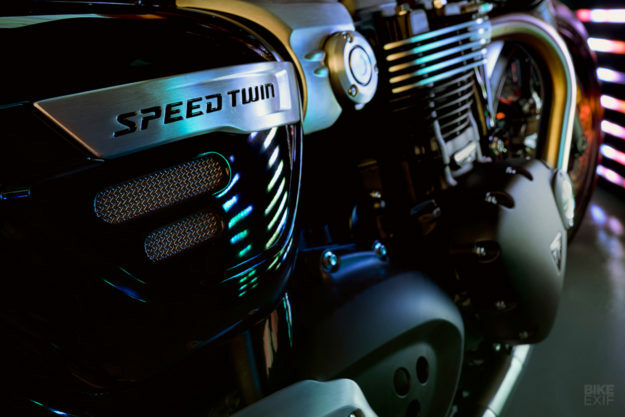 Will the Speed Twin live up to the legend? We have a feeling it just might. UPDATE: Our Speed Twin review is now live.